INDIANAPOLIS, July 25, 2018 – Many of the USA’s top and aspiring gymnasts are heading to the Schottenstein Center in Columbus, Ohio, for 2018 GK U.S. Classic. On Saturday, July 28, the GK U.S. Classic has athletes competing on the junior level at 1:30 p.m. ET and the senior level at 7:30 p.m. ET. The weekend’s festivities kick off on Friday, July 27, with the GK Hopes Championships, which features female gymnasts who are just below the elite level, at 2:30 p.m. ET. In the senior session, fans will have the opportunity to see several World, Olympic and U.S. champions and medalists in person. Among those expected to compete are reigning World all-around champion Morgan Hurd of Middletown, Del./First State Gymnastics, Olympic all-around champion Simone Biles of Spring, Texas/World Champions Centre, and U.S. all-around champion and 2016 Olympic alternate Ragan Smith of Lewisville, Texas/Texas Dreams Gymnastics, along with 2017 World vault and floor exercise silver-medalist Jade Carey of Phoenix, Ariz./Arizona Sunrays. Single session tickets for the GK U.S. Classic on July 28 are $35-$45 for the junior session at 1:30 p.m. and $39-$59 for the senior session at 7:30 p.m. All times are Eastern and subject to change. The GK Hopes Championships takes place Friday, July 27, the day prior to the GK U.S. Classic, and tickets range from $20-$30. All-session ticket packages, which include admission to the junior and senior elite sessions along with the GK Hopes Championships, are still available and range from $79-$129. Ticket prices vary according to competition session and seat location. Ticket prices listed here do not include applicable service charges. Tickets may be purchased at the Box Office, ticketmaster.com or charge by phone at 1-800-745-3000. On the concourse, fans will have the opportunity to take photos in GK’s selfie station and browse through GK’s popular leotard styles; check out GK U.S. Classic merchandise and purchase Biles’ book, “Courage to Soar”; and members of the Ohio State University Women’s Gymnastics Team will be handing out posters and signing autographs prior to the Saturday evening session. The GK U.S. Classic is the last opportunity for female gymnasts to qualify for the 2018 U.S. Gymnastics Championships, the national championships for men’s and women’s gymnastics. Gymnasts who have already qualified to nationals use the GK U.S. Classic as a final tune-up for the U.S. Gymnastics Championships. Fans who can’t attend the GK U.S. Classic in Columbus can follow the action live on both television and the web. USA Gymnastics will provide a webcast of the GK Hopes Championships on July 27 and the junior session of the GK U.S. Classic on July 28. The webcast of the senior women’s GK U.S. Classic may be viewed on mobile devices via olympicchannel.com/en/tv or NBCSports.com. All times are Eastern and subject to change. July 28 - 8 p.m. - GK U.S. Classic, seniors - OlympicChannel.com/en/tv, Olympic Channel app, NBCSports.com or NBCSports app. The senior competition has several additional members of the U.S. National Team. Jordan Chiles of Vancouver, Wash./Naydenov Gymnastics, the all-around bronze medalist at the World Cup in Stuttgart, Germany; senior. Audrey Davis of Frisco, Texas/WOGA Gymnastics, sixth in the junior all-around at the 2017 U.S. Championships; junior national team competing as a senior. Kara Eaker of Grain Valley, Mo./Great American Gymnastics Express, 2017 U.S. junior balance beam champion; junior national team competing as a senior. Emma Malabuyo of Flower Mound, Texas/Texas Dreams Gymnastics, 2017 U.S. junior floor exercise champion; junior national team competing as a senior. Grace McCallum of Isanti, Minn./Twin City Twisters, 2018 Pacific Rim all-around champion; senior. Riley McCusker of Brielle, N.J./MG Elite, 2017 U.S. uneven bars champion; senior. 2018 Pacific Rim and Junior Pan American Championships junior all-around champion Jordan Bowers of Lincoln, Neb./Solid Rock Gymnastics, headlines the junior field. The remaining junior national team members expected to compete are: Sydney Barros of Lewisville, Texas; Kayla DiCello of Boyds, Md./Hill’s Gymnastics; Sunisa Lee of St. Paul, Minn./Midwest Gymnastics Center; JaFree Scott of Independence, Mo./Great American Gymnastics Express; Tori Tatum of Chanhassen, Minn./Twin City Twisters; and Leanne Wong of Overland, Kansas/Great American Gymnastics Express. 2018 Hopes Classic all-around champions Ava San Jose of Chatsworth, Calif./Paramount Elite Gymnastics (10-11-year-old division) and Mya Witte of Greenacres, Fla./Genie's Gymnastics (12-13-year-old division), headline the field for the GK Hopes Championships. The GK Hopes Championships has two age groups, 10-11 year-olds and 12-13 year-olds. The top 18 from each age group at the Hopes Classic qualified to the GK Hopes Championships, assuming each athlete achieved a minimum qualifying score. The GK Hopes Championships is the culmination of the Hopes season. GK, a long-time partner of USA Gymnastics, recently became the title sponsor for the GK U.S. Classic and the GK Hopes Championships. The Schottenstein Center, in partnership with the Greater Columbus Sports Commission, is playing host to two events. 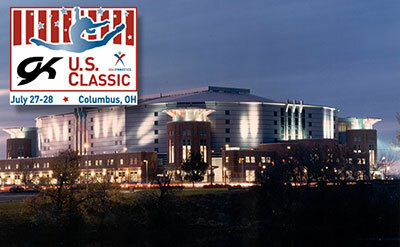 Columbus has held the 2012 and 2016 post-Olympic tour, as well as the 1992 U.S. Championships. GK – Elite Sportswear. Elite Sportswear is the combination of the worlds’ leading sports specialty apparel brands including, GK Gymnastics, Dreamlight Gymnastics, All Star Cheer, Omni Cheer and Dolfin Swimwear. Distributed in over 35 countries, Elite Sportswear products have been worn by Olympians and World champions for over 35 years. Employing over 500 people between two locations in Reading, Pa. and San Diego, Calif., Elite Sportswear continues its commitment to American-made quality and continuous innovation in designs with unprecedented fit, form and function. For more information about Elite Sportswear, visit www.gkelite.com. Schottenstein Center. Located on the campus of The Ohio State University, the Schottenstein Center is a 770,000 square-foot multipurpose venue. Home to the men’s ice hockey and men’s and women’s basketball Buckeyes, it is the largest arena in the Big Ten. Averaging over 1 million guests per year, the building has hosted The Rolling Stones, Ohio High School Athletic Association state championships in wrestling and girls and boys basketball, The Frozen Four and the McDonald’s All-American basketball game amongst a variety of sporting and special events. A nationally recognized sports and entertainment center, the Schott continues a tradition of making memories. Greater Columbus Sports Commission. Since 2002, the Greater Columbus Sports Commission has been a catalyst in transforming Columbus into one of the world’s best sports destinations, booking 427 new sporting events for the Columbus Region and generating an estimated $535 million in visitor spending. Our mission is to rally Columbus to compete and win sporting events, providing a singular athlete and fan experience and positively impacting our image, economy and lifestyle. For more information, visit columbussports.org.